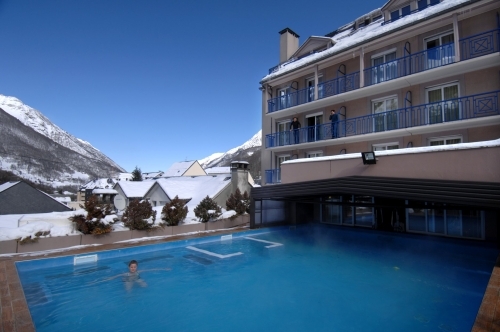 Le Domaine des 100 Lacs is a large residence located in the upper area of the beautiful spa town of Cauterets. 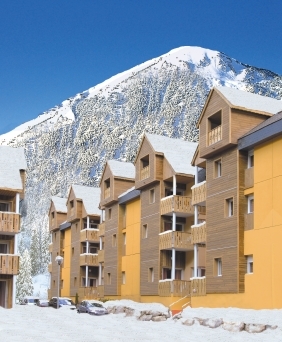 It is ideally located just 500m from the Lys cable car and 1km from the village centre and thermal spa centre. 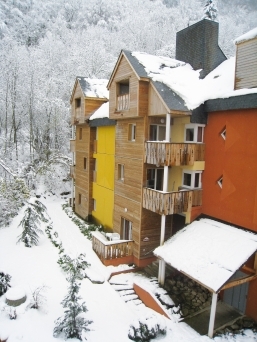 Le Domaine des 100 Lac is built in a way respectful of Pyrenean architecture using traditional wood, stone and slate and is composed of three 6-storey buildings (with lift). 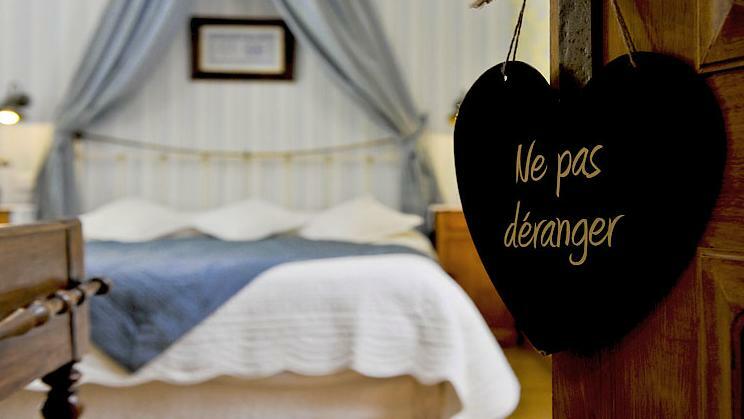 Facilities at Le Domaine des 100 Lacs include free access to the semi-covered heated swimming pool with Jacuzzi (15m x 5m, open Sun-Fri 10:0 0-19:00), and fitness room, sauna and steam room (1 free session/apartment/week then payable), breakfasts can be purchased, laundry room (payable), Wi-Fi internet access in most of the apartment (payable) and free outdoor parking (subject to availability). The loan of board games is possible plus cots and high chairs (for children under 2 years, all subject to availability, request at time of booking) and raclette sets can be hired (subject to availability). 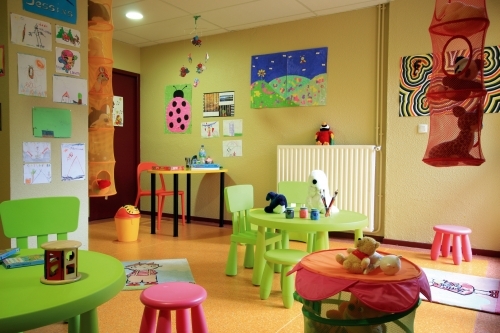 Le Domaine des 100 Lacs also offers a childcare service at ‘Le Jardin de Blanche Neige’ for children aged 6 months to 10 years (Monday – Friday, 08:30 - 18:00), offering activities and games to keep your little ones amused (payable, places must be reserved, pre-bookable, from 19/12 to 2/4 meals are not included). 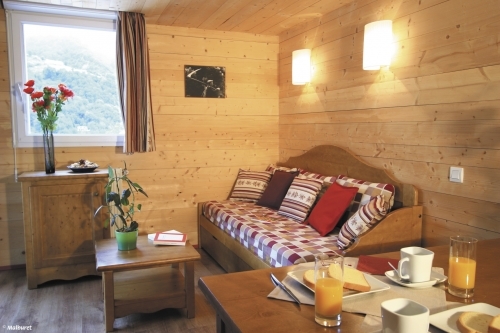 All the stylish self-catering ski apartments at Le Domaine des 100 Lacs in Cauterets are fitted and furnished to a very good standard of comfort and convenience. 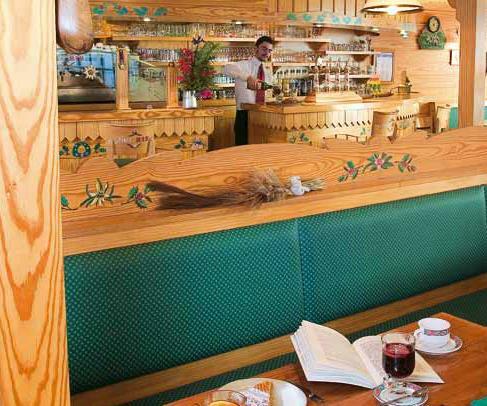 The interiors are bright, traditional and homely. They all have a fully equipped kitchenette with electric hob, microwave, coffee-maker and dishwasher, TV and a furnished balcony or terrace. Studio sleeping 2 (ca. 15m2): Open plan living/dining area with double sofa bed or single sofa bed and single pull-out bed, bathroom with WC. Balcony or terrace. Studio Alcove sleeping 4 (ca. 21m2): Open plan living/dining area with double sofa bed or single sofa bed and single pull-out bed, 1 alcove with double bed & bathroom with WC. Balcony or terrace. 1 Bedroom Apartment sleeping 4 (ca. 25m2): Open plan living/dining area with double sofa bed or single sofa bed and single pull-out bed, 1 double bedroom, bathroom with WC. Balcony or terrace. 1 Bedroom Alcove Apartment sleeping 6 (ca. 30m2): Open plan living/dining area with a sofa bed (converts to 2 single beds), 1 double bedroom, 1 alcove with bunk beds, 1 bathroom or shower room with WC. Balcony or terrace. 2 Bedroom Apartment sleeping 6 (ca. 35m2): Open plan living/dining area with a sofa bed (converts to 2 single beds), 1 double bedroom, 1 bedroom with bunk beds, 1 bathroom with WC (some are separate). Balcony or terrace. 2 Bedroom Alcove or 3 Bedroom Apartment sleeping 8 (ca. 53m2): Open plan living/dining area with a sofa bed (converts to 2 single beds), 3 bedrooms sleeping two people or 2 bedrooms sleeping two people and 1 alcove with bunk beds. 1 bathroom with WC. Some apartments are split level. Balcony or terrace. Please note: Alcoves are usually not enclosed, have bunk beds and no window. 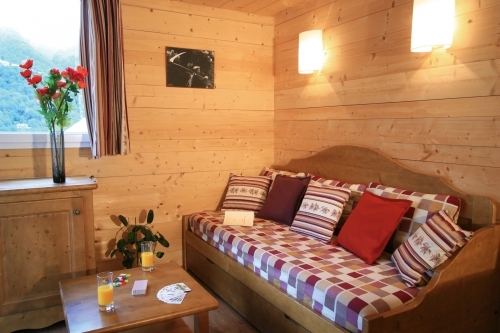 For any apartments/chalets at Le Domaine des 100 Lacs in Cauterets that feature bunk beds, sleeping in the top bunk is not recommended for children under the age of 6 years old. 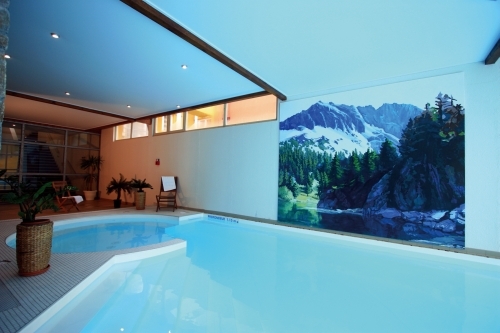 Fully equipped apartment, TV, ski locker, swimming pool with Jacuzzi (open Sun-Fri 10:0 0-19:00), 1 free sauna or steam room session per apartment, outdoor parking space (subject to availability). - Hire of towel kit (hand, bath & tea towel): £5/person. - Beds made on arrival: £23/apartments sleeping up to 4, & £27/apartments sleeping 6 & £31/apartment sleeping 8. - End of stay cleaning (excluding kitchen area & dishes): £27/apartments sleeping up to 4, & £37/apartments sleeping 6 & £45/apartment sleeping 8. - End of stay cleaning (excluding kitchen area & dishes) & beds made on arrival: £42/apartments sleeping up to 4, & £56/apartments sleeping 6 & £68/apartment sleeping 8. 19/12 – 02/01 & 06/02 – 05/03: 6 – 23 months old: £11/half day; £23/day; £53/5 half days & £76/5 days. 2-10 years old: £10/half day; £19/day; £40/5 half days & £67/5 days. 02/01 – 06/02 & 05/03 – 02/04: 6 – 23 months old: £10/half day; £20/day; £46/5 half days & £69/5 days. 2-10 years old: £9/half day; £17/day; £35/5 half days & £58/5 days. 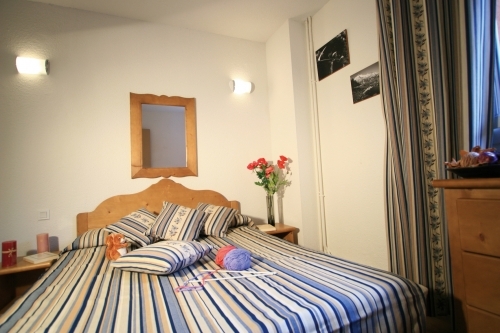 - Refundable breakage deposit: €200/apartment (cash or credit card) - Please note no deposit, no keys! 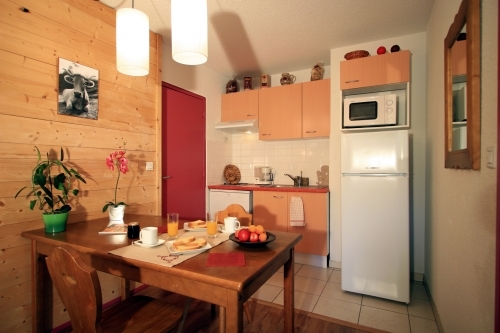 - Charge if apartment is not left clean and tidy: €35-€59/apartment. 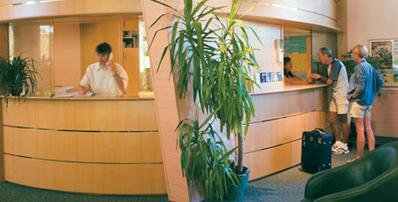 - Access to the sauna & steam room: €8/session or €39/6 sessions (1 free session offered per apartment and per week). - Hire of cot or high chair: €15/stay/each or both: €25/stay (max age: 2 yrs, request at time of booking, all subject to availability). - Launderette: €5/wash & €3.50/dry. 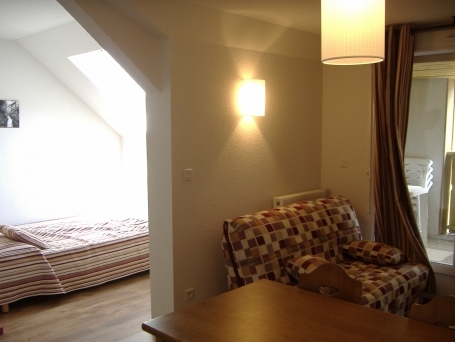 - Wi-Fi internet access (available in most of the apartments): from €2.90/day or €25/week. Pets are allowed and will be charged €39/week (payable locally). A valid passport for your pet is compulsory. 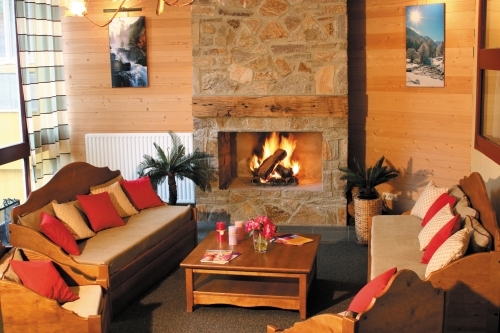 Arrival day at Le Domaine des 100 Lacs is any day (unless otherwise stated) 17:00 - 20:00 and Departure by 08.00 - 10:00.